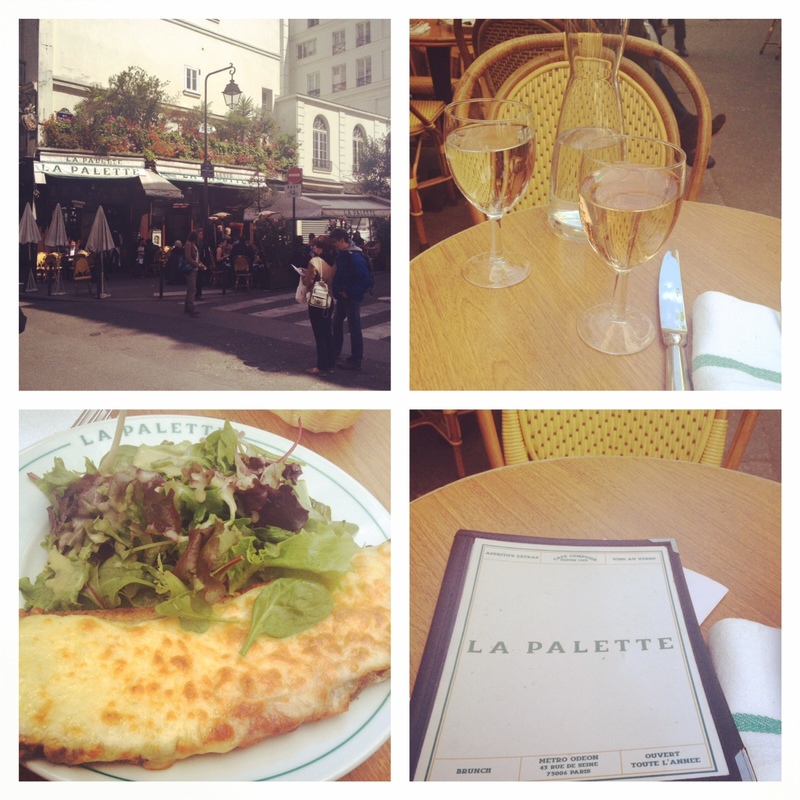 When I first moved to Paris I was too shy to sit at a table on a bistro terrace. I felt intimidated by all the people drinking their coffee or sipping wine whilst puffing away on their cigarettes and laughing with their friends. I was alone and ashamed of the way I sounded so foreign as if I just stepped off the Eurostar speaking French with my broad London accent. Yet, here I am 4 years on eating alone in restaurants without fear still speaking French with that just off the train accent. All this may never have happened if it wasn’t for the Guardian of the apartment building where I now live taking pity on me and putting a good word in at the agency so that I could finally have a little studio. Renting an apartment in Paris as a foreigner is a painful, gut wrenching experience. Monsieur P. was my hero who in no small way stopped me from heading back to London and allowed me to finally live the Parisian adventure I dreamt of. Except that just over a week ago, Monsieur P was found dead in his Guardian’s lodge and no one yet knows how or why. To say it is shocking is to understate it – some people go to church when they hear of someone’s sudden death I decided to go to La Palette. This was the first place I summoned up the courage to eat solo at this hidden gem in Paris St Germain and a fitting way to toast the kindness of Monsieur P.
La Palette is located a 5 minute walk from Paris St Germain square and the mythic cafes of Les Deux Maggots and Cafe Flore which everyone has to go to at least once I suppose to say they’ve been. Walk away from tourist hell central and head down the quiet rue de Seine as it’s name suggests leads straight to La Seine and you will see half way down La Palette. It is said that Picasso, Hemingway and Henry Miller frequented this place. So for all you literary types looking for inspiration or wanting to walk in the footsteps of your literary idol head on down to La Palette. Whilst it may not be a bona fide tourist destination as are Cafe Flore and Deux Maggots it does still draw the beautiful people of the 6th arrondissement. I always get a warm welcome whenever I come to eat here and last Saturday was no exception when I asked for a table for one. I was offered one on the crowed terrace -it is a hugely popular place – except that I know not to ask for a table that has reservé on it. Those are the tables that have the best people watching location and even if there is nobody sitting there save yourself the hassle and ire that you will feel when the maitre’d tells you no. Those tables are only for the special people. I am sure everything on the menu is good if my croque monsieur is anything to go by. 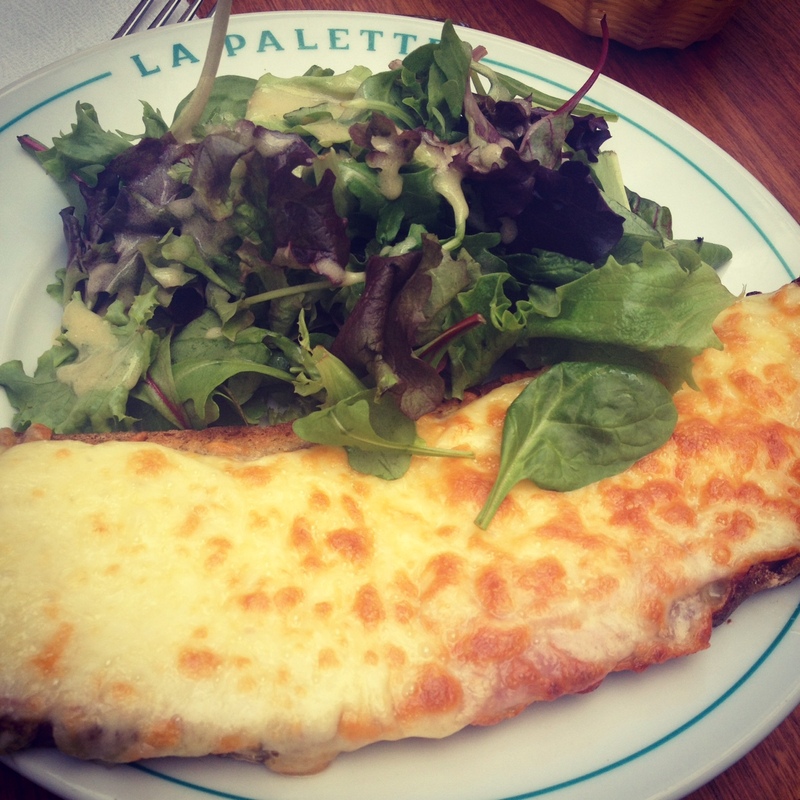 However, I only ever order one thing here the croque monsieur – I love it. It is served on a thin slice of Poilane bread, layered with ham and all habitual croque monsieur ingredients and the wonderfully mustardy vinaigrette that the accompanied salad leaves were covered in. 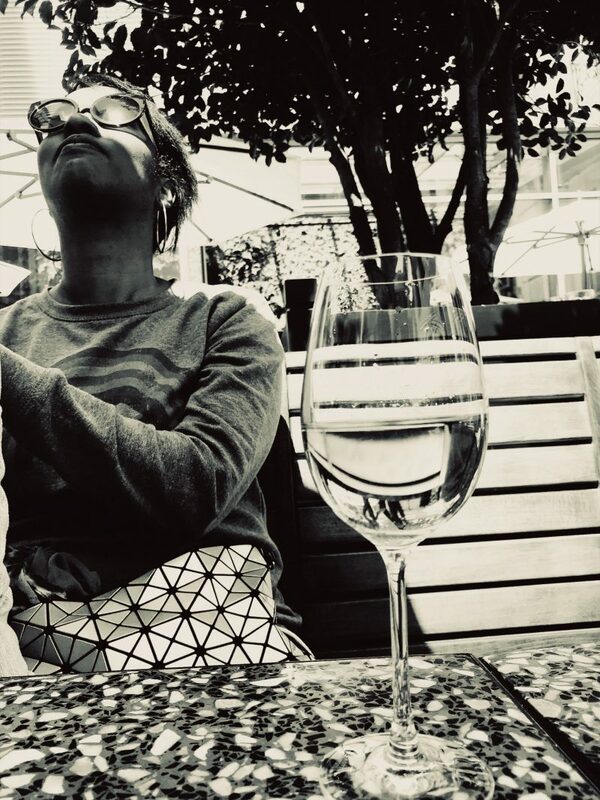 Given the sun had finally deigned us with her presence that day I ordered a glass of rosé as well. 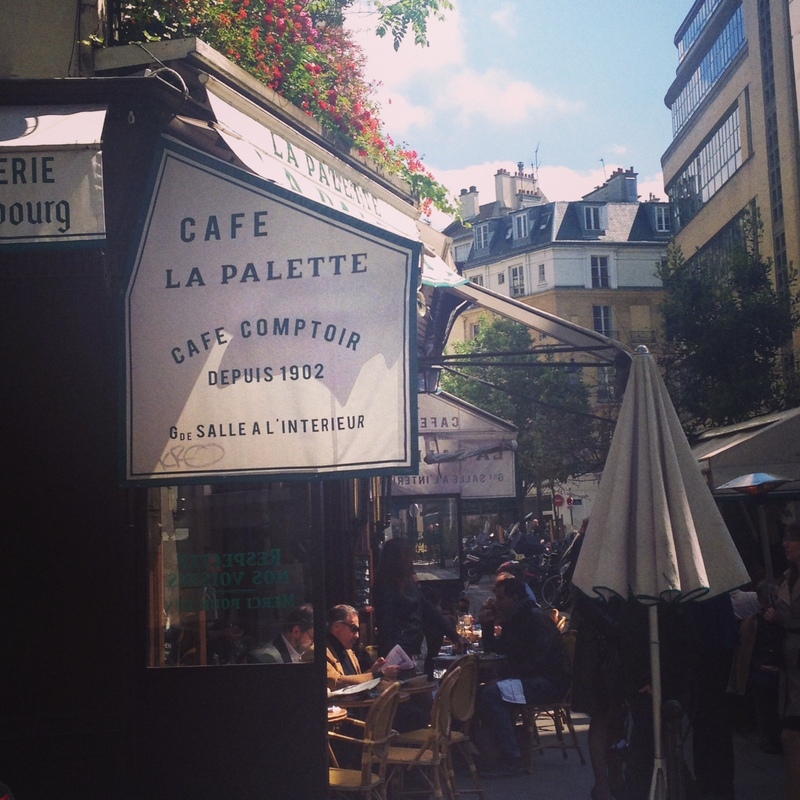 For me a croque monsieur and a glass of rosé in the Spring sunshine sums up the Ella Fitzgerald “I love Paris in the Springtime” perfectly and it was also the best way I could think of saying merci to Monsieur P who will be truly missed. Pricey? Not really for the location and quality actually pretty reasonable – my croque monsieur was around €11 and €4 for the wine.